Summary: Harriet Tubman’s story is told in reverse, beginning when she is “an old woman/tired and worn/her legs stiff/her back achy”. Before that, she was a suffragist, and before that, a Union spy. 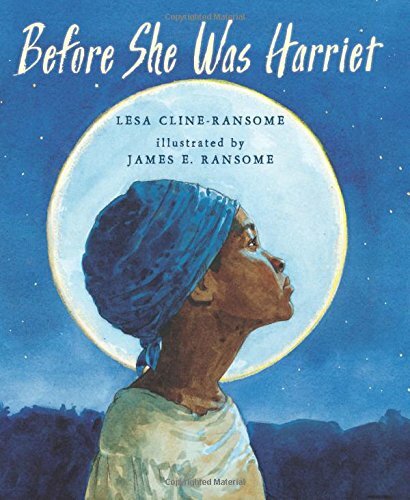 The narrative continues back in time, showing Harriet as Moses, conducting slaves to freedom on the Underground Railroad, and finally, all the way back to a child named Araminta, “who dreamed/of living long enough/to one day/be old/stiff and achy/tired and worn and wrinkled/and free”. 32 pages; grades 1-4. Pros: A brief, poetic look at Harriet Tubman’s life and many achievements, beautifully illustrated by Coretta Scott King medalist James Ransome. Cons: I was disappointed that there was no back matter giving more biographical information.